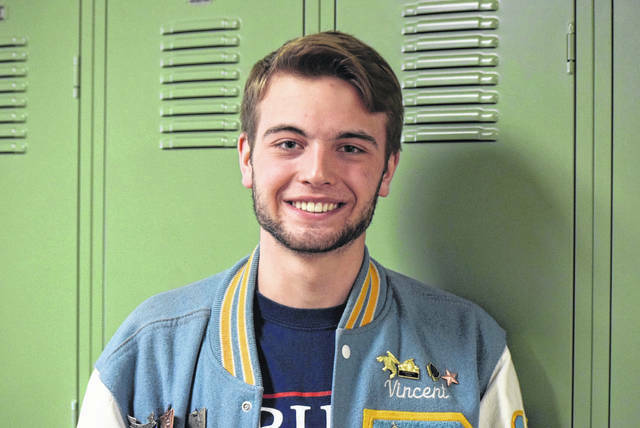 BATH TOWNSHIP — Vincent Abrams, 18, a senior at Bath High School, is keeping busy as his senior year winds down and he prepares for life after high school. Abrams is the captain of the track and cross country teams at Bath High School and is student council president. “It’s helped me to understand how to work with other people from differing opinions. How to go forward even though there might be a divergent way of thinking,” said Abrams. His list of accomplishments are many. •President for the National Youth Leadership Training Organization. •Treasurer of the science olympiad. •Works for the student newspaper and a member of the newscasts where he interviews students. •Homecoming King and All Sports-Court King. •Volunteer at Mercy Health-St. Rita’s Medical Center in the summer. And if that’s not enough, he holds down a part-time job at Texas Roadhouse to try and raise money for college. His participation in sports has taught him some valuable life lessons. “It’s helped me to understand that competition is a huge factor to what this world is and you should always put your best foot forward and give it your all, no matter what circumstances you’re at and you should just keep a positive attitude and good things will come to you,” said Abrams. He is hoping for an appointment to West Point or the Naval Academy. If that doesn’t work out he plans on going to The Ohio State University. “I want to major in economics and law. Ever since I was young I was interested in history and how to apply it to things and to me economics is a pragmatic practical approach to solving the world’s problems through math and through reasoning and it’s just a good application of both history, language and math to do something better. Law, it’s kind of the same thing. It’s the application of what we have as our system and how we can change things and make things better, I suppose,” said Abrams. Abrams is trying to decide whether to become a lawyer or a military officer. “If I can’t get into the JAG program I would just go into armored warfare if I’m accepted into West Point or ROTC program [at Ohio State],” said Abrams. His inspiration to join the military and become an officer is rooted in family. “My dad and my grandpa, my uncles and my great-grandpa, everybody that I know of served in the military, but nobody’s been to college yet. I want to continue the tradition of serving my country. I just feel this passion to do so. I also want to be the first person in my family to go to college because my dad’s given me the opportunity to do so,” he said. Abrams is satisfied with his experience with Bath schools. “It’s been a pretty positive experience. Everybody’s been kind to me and given me every opportunity necessary to succeed and to have such ambitions and the best opportunity to reach for them and go for them,” said Abrams.